“Gloom” by Atlas Games is a very unique and innovative card game for 2-4 players. The game puts you in control of one of 4 twisted families: Castle Slogar, Hemlock Hall, Blackwater Watch and Dark’s Den of Deformity. Your goal is simple: make your family have the worst day possible and then put them out of their misery by killing them off. The game ends as soon as one family is completely killed and whoever has the family with the lowest “self-worth” points wins the game. Unquestionably, the major draw to Gloom is its amazing translucent cards. The cards are made of a floppy, see-through plastic (which, by the way, shuffle like a dream). Incredible art work is printed on both sides. What makes the game truly innovative is the way the cards stack. Through the game, players will be playing modifier cards on themselves and other players. Since the cards are translucent, elements from the previous cards either show or are obscured by the new cards played on top. This makes the point modifiers placed on the cards easily visible for each character. As the Atlas Games’ website puts it, “You’ve got to see (through) this game to believe it!”. It’s wildly clever and works really well. You do truly have to see it in action to appreciate it. Gloom’s artwork and theme lends itself to being spooky and macabre, but still stays light-hearted in a cartoony way. If you are a fan of The Addams Family, A Nightmare Before Christmas, Coraline, Tim Burton or just plain spooky Halloween fun, then this game might be right up your alley. Atlas Games has also thought of something that I think is quite unique for any Board or Card Game. Their website provides a “How to Host a Theme Party”, with complete instructions on the Setting, Invitations, Music and Attire. Combine this with the fact that the website also allows you to print your own custom playing cards with fonts for the different families of the game. Someone could really run with this idea and throw a full blown Gloom bash! This idea is something you don’t often see and wanted to applaud Atlas Games for their effort to make this game come to life! Every card in the game has flavor text on it. That’s fine, in fact, most of it is quite funny. The problem is some of the cards also have additional game state modifiers that may alter your hand size, cause you to skip a turn, or some other ongoing game effect. Since the fonts and colors of these texts are so similar, usually stacked on top of each other in the same text box, it’s VERY easy to overlook an effect that is currently in play. Combine this with the fact that cards are constantly getting covered up. Soon you will find yourself sitting on a family inundated with text, most of it of no consequence and yet one card is absolutely crucial to game play. You’ll want to really stay focused on what modifiers are effecting what, but that’s pretty hard to do when the other part of your brain is too busy trying to tell the story about how Cousin Mordecai was taunted by tigers before finding fame at a feast. Designing the critical game text to better stand out from the flavor text would have been a huge help. I’ve read a few reviews saying that the ink on the cards (particularly in the initial runs of this game) had a tendency to smear. Luckily, my copy hasn’t had this problem, but I know I would be pretty gloomy if I got a bad batch. This is doubly concerning seeing as these aren’t really the type of cards that are conducive to putting in sleeves (since you need to be able to see through them clearly when they stack). Another issue that I immediately came up upon getting the expansion was just plain storage. The expansions cards immediately blend right into the core deck, but the core deck box just holds the core deck amount of cards. If you picked up the 3 expansions, the Cthulu Gloom set and the Cthulu expansion, that’s a huge stack of cards that is going to require a new deck storage solution to hold it in. Otherwise, you are just going to have to cut the one big deck down into it’s 5 or 6 little boxes. The game is rated for ages 8 and up. Seeing as the point of the game is dragging your family through horrifically painful plights and then murdering them off so you can win the high score may not sit well with some parents. That said, the game does do a great job in keeping as light and kid friendly as a Halloween type card game can be. It’s never more graphic than a cartoon skull or a brain sticking out of a teddy bear’s head, but I could see why some parents might object. Gloom is an innovative and wonderfully spooky romp of a card game that shines bright at first but can fade fast. I attribute this mostly to the fact that you need to actively participate in the storytelling aspect to get the most out of it. If you are the type of gamer that just wants to sit down and play the game without having to spend a ton of effort to “making the game fun”, then this might not be the game for you. Once you remove the storytelling aspect, you are still left with a decent card game, but one that can also feel repetitious. Some ink smearing issues along with some design concerns regarding the sameness of fonts on the flavor text/game text may leave you a little bummed. There might also be some parental concern with its appropriateness. (You are actively killing off your family, after all). Gloom may just be the perfect light card game you pull out every now and then to showcase off its novelty, but the only Gloom I get is from the amount of dust its box has collected on our shelf. Star Wars pits 2 players (One side playing as the light side, and one side playing the dark side) in an epic battle for the force. The win conditions for each side differs, the Light side is trying to take out 3 Dark side objectives, before the Dark side can spin their Death Star dial up to 12 (which essentially acts as the game’s clock). The Dark Factions are: Sith, Imperial Navy, Scum and Villainy. It pretty much goes without saying that if it’s coming from Fantasy Flight, it’s going to be quality. The glossy cards, the exceptional artwork, the beefy tokens… everything you’ve come to expect from FFG is here. A+ as always. It’s my understanding that as of this moment, FFG only has the rights for the original trilogy. So, this game is classic Star Wars. (Which I know will make many… many… fans happy). This is O.G. Star Wars as it should be! Luke, Han, Vader, Leia, Emperor, Boba Fett, Stormtroopers. No Jar Jar. No midiclorians. None of the things that make you want to rip the arms off a gundark. Just the good ol’ SW. There even appears to be elements of the Expanded Universe sprinkled in there too. (Yes, Mara Jade is on a few of the event cards… not directly called out by name, but that’s her alright). Is it possible that we’ll see other Timothy Zahn characters emerge? (An Admiral Thrawn perhaps? ?… hint hint FFG) . Only time will tell. So, if you had your heart set on reenacting Trade Federation embargoes, this may not be the game for you. The light side is trying to take out the Empire’s objectives. The dark side is trying to charge up the Death Star laser clock of doom. Not only is this fitting for the theme of the movie but it also keeps the game fresh. (Often, my wife and I play our decks… then swap factions right after for our second game). Your mindset for how you tackle this game completely changes depending on what side you pick, and I think this is a huge plus for keeping the game fresh and interesting. At first, I wasn’t sure if the deck building in this game was a “pro” or a “con”. I’ve since very much warmed up to it. Here is how it works: When building a deck, you select an Objective card which goes in your objective deck. That objective card, however, is only 1 of 6 of a set. There are 5 other cards that are tied to the objective which go into your draw deck. A standard tournament deck contains 10 objectives, so by default, your draw deck contains the 50 corresponding cards. When building a deck, you can’t break up any of the cards within in its “pod” separately. They are an “all or nothing” set. What this equates to is if there’s a card in your deck that you’re not a huge fan of and would like to remove, you have to pull the whole set and swap in a new “pod”. Some might find this style easier and some might find this restrictive. Personally, I just think it’s cool because it’s something I’ve never really seen before. Once you play this game, you quickly realize that in order to be successful, you’ll need certain cards to play out and others that are either block fodder or that are just fuel for an edge battle, and I really feel that the pods have been designed keeping this mind. As time goes on, more and more pods will be released, so anyone with the initial feeling of this being “too restricted” will most likely fade. This game does have a bunch of tokens going for it. When a card is focused (i.e. tapped/knelt/spent) it is indicated by placing a focus token on it. This requires quite a lot of focus tokens to be out on the board, which can be a little hairy. It’s not a big deal once you get used to it (and is a necessary evil since cards can be exhausted for multiple turns and you need a way to indicate this), but by the time you add in the damage tokens and the shield tokens… well, you’ve certainly got a lot of tokens on the table. With 1 core set, you’ll certainly have enough to start playing (and having tons of fun), but there’s only enough cards to really get 4 of the 6 factions going. If you are serious into playing competitive tournament decks, it’s a given that you’ll want to be running multiples of your best cards, and a single copy of a Vader or a Yoda just isn’t going to cut it. Fortunately, you can only ever run 2 of the same objective, so 2 cores would be all you’d ever need. This game is still in its infancy (as of the time of this review – Late January 2013) and there is already a need for FFG to get a FAQ out there. For the most part, the game plays quickly and pretty straight forward, but there are some cards and rules that have conflicts and until an errata or FAQ gets posted you may have to come up with some house rules to deal with them. (Don’t believe me? Just head over to the FFG Forum and read through the 6 plus pages of circular argument that is the “Trench Run” card and you’ll know what I’m talking about”). In other games, if you come across a broken card, no biggie, just don’t run it, but in Star Wars, one card is connected to the pod. Pulling that 1 out means pulling out its 5 buddies. FFG is always good about resolving these issues and coming out with FAQs, so eventually this will be a non-issue. But for today, you’ll just have to live with it. There are no restrictions on characters or vehicles being able to attack/defend one another. What this means is you might have an Ewok defend against a Tie Fighter or Luke attacking a Star Destroyer. I’m sure you can already hear the inevitable fanboy complaint of “What did Luke do? Fly through space and cut the ship in half with his lightsaber?” The best counter I’ve heard to this argument came from the “Smuggler’s Den” podcast (I’m not affiliated with them or anything… it’s just a cool Star Wars LCG podcast that I highly recommend). They framed it in a way that explained “Han went to Endor in Return of the Jedi, and his actions shutting down the shields enabled the fleet to blow up the 2nd death star. So, in that regard, Han beat the Death Star”. When viewing the game through this “cinematic” lens, it may help you come to terms with what looks like a “silly battle” on the table. OR you could just lighten up, it’s just a fun card game in the Star Wars universe. Limited Factions: The core set only comes with 1 pod for the light side faction “Spies and Smugglers” and 1 pod for the dark side “Scum and Villainy”. Unless you have multiple copies of the core set, it’s pretty much useless to try to include these in any deck builds at this time. Which is a DRAG because Han Solo is in the one set and Boba Fett is in the other! Obviously as the chapter pack expansions come out, these factions will become more prevalent, but just know that if you only have 1 core set, these are pretty much just a tease for the moment! But, with it being a brand new game, there are a few rule issues that still need to be addressed, but I’m fully confident that FFG will get everything hammered out. Some diehards might get hung-up on the fact that characters can fight spaceships, but that’s for the nerf herders to lose sleep over… not for the gamers just looking for a fun card game. The essence of Star Wars is here in spades. The art is amazing. The components are top notch. The deck building is innovative. It’s highly possible that this might take over as our new top LCG! The next time you are heading to Tachi Station to pick up some power converters and blue milk for your Aunt, make sure to pick up a copy or two of this sweet game! Fans of the HBO show and/or Martin’s “A Song of Ice and Fire” novels, casual/beginner gamers looking for something a little more strategic, gamers looking for a good “gateway” game to introduce to non-gamers. Die-hard/Experienced “A Game of Thrones Living Card Game” players. This “HBO themed version” is a streamlined reworking of the popular “A Game of Thrones Living Card Game”. And while the two versions are very similar in their root mechanics, it’s important to note that this HBO version is a standalone game and is not compatible with the LCG version on which it’s based. It’s basically “LCG Lite”. The game pits two fixed 50 card decks (Starks vs. Lannisters) in an epic battle to garner the most power to your house banner. This is accomplished through the marshaling of Characters and Locations and engaging one another in a series of Military, Intrigue and Power challenges. Along the way, both sides are able to manipulate certain rules through the use of “Plot Cards”. All of the cards contain high gloss photos of all your favorite Game of Thrones characters with fantastic and stylish looking House Sigil artwork on the backs. Although this game is a stripped down version of the regular LCG game, it still retains much of the same round structure and basic rule flow as its predecessor, which still might be intimidating to a “non-gamer” type not accustomed to hobby type cards games. (Or to put it another way, this game might be closer to a “Magic the Gathering” game than it is say to “Uno” or other basic type card games you typically find at Target/WalMart/Etc). If you are turned off by strategy games that require reading and referring back to a larger than normal rulebook, then this might not be for you. It should also be noted that this is a 2 player ONLY game, which might be a strike against it if you are looking for a new group game. Since Fantasy Flight has designed this as a balanced standalone game, it’s unclear at this time if there will ever be any further expansions adding to the set. First, let me start off by saying I have owned and enjoyed the LCG for years, and have several of the expansions. However, if I had one bone to pick with the “full version” it that it can get a little heavy on the rules sometimes. Most of the 2 player Joust games I’ve played with my wife last for hours and almost always gets derailed several times a round having to consult the FF Forums or FAQ for an answer to some “legal jam” when a conflict of card resolution gets called into question. We play this game often and STILL inevitably have to go hunting for some sort of rules clarification. The play decks are fixed, but the plot cards are not. In fact, the game comes with 32 different plot cards, of which you perform a “plot draft” to get to your 7 total. (A pick and pass system, think “7 Wonders”). This small bit of deck building variation helps with replay. I will note that the effects on the plot cards feel a little more watered down, i.e “when revealed draw 2 cards”, but there’s still a few epic ones in here. (And yes, the classic “Valar Morghulis” is one of them). If you have played and understand the LGC rules, then you are pretty much ready to go out the box with this version. The keywords for the cards have been almost removed entirely with the exception three: Renown, Stealth, and Limited. (Which function the same as the LCG). The turn order, the challenges, the “dead pile” & “discard”, play to 15 power, all the same. You might be happy to know that the decks do contain a few duplicate copies of certain characters (Eddard, Robb, and Jon Snow for Stark, Jaime, Tywin, Tyrion, Cersei and Joffrey for Lannister). For those of you like me that purchased 2 or 3 copies of the LCG Core set in order to have multiple dupes, FF has at least thrown you a bone with this one. There are a few rules differences with HBO version that I thought I’d point out. First, both decks contain the same unique “neutral” cards (Littlefinger, Varys, The Iron Throne). However, there’s no restriction for each player to have their copy of their unique character in play simultaneously. Meaning that both players can have a Littlefinger in play without violating any rules about them being unique. Also, just because my Varys is in my dead pile doesn’t prevent you from playing your Varys. He’s only “dead” as far as my side/deck is concerned. Another rule pertains to the lowering of strength and it’s affect on challenges. Characters who have been reduced to zero strength through plot effects can still initiate and WIN challenges (and even gain an additional power for unopposed challenges). So, if I initiate a challenge with a character whose strength is zero, and you block with someone who also has a strength of zero, I still break the tie and win the challenge. I’m fairly certain that in the LCG you have to have at least 1 strength to win, but Fantasy Flight has confirmed this “Zero Rule” to be true on their discussion board. The game is fantastic to look at. The cards have a high gloss photo-like sheen which really becomes a thing of beauty when the game is in full action on the table. This card coating does however make the cards a little slippery when stacked. The house sigil artwork on the back of the cards is a great stylist touch and back of the plot cards have an ominous image of the Iron Throne. The Dragon Coins and Power markers are made of thick cardboard (very similar to the LCG). As one can always expect from Fantasy Flight, high marks for the quality and design of the components! Instead of the house cards, the game includes great looking house banners (Also made of very thick cardboard). It’s a great touch that looks good on the table, but I will say that there’s something strange to note: Unlike the LCG house cards, these banners no longer include the turn order/steps for quick reference. That’s not really a problem for the veterans, but given that this is designed to be introduction game for beginners, it’s curious that they took those out! It’s a Minor quibble and basically a non-issue for people who already know what they are doing. The back of the manual however does have a nice Turn order reference sheet. The game looks great and plays much quicker than the LCG (seeing as many of the keywords have been reduced). The HBO version is much simpler than the LCG (which my wife and I can appreciate) but even so, we’ve STILL come into a few head scratching timing/resolution issues. As of this moment (December 2012) Fantasy Flight doesn’t really have a FAQ, so we’ve already had to adopt some house rules when dealing with certain card conflicts. Over time though, the FF Forums may hammer these issues out, and maybe they’ll create a FAQ. My real concern is if we’ll eventually tire of the same “Stark vs Lannister” routine, especially since the decks are fixed. In fact, the first thing my wife said to me when we opened the box was “I want to be Targaryan”. (which is her LCG go-to deck) so there was immediate disappointment. Sorry folks, no Dany or Drogo to be seen here! It is known. Given that the purpose of the product is to introduce gamers to the basic rules and then expect them to “graduate” up to the LCG, it’s probably unlikely that any sort of expansions will be coming for this HBO version. If that’s true, then it’s a shame, because I really like this HBO version a lot and would definitely buy a Baratheon, Targaryan or any sort of deck expansion. It seems like it would be easy to do, given that there’s no lack of characters to draw from on the HBO show. Come on Fantasy Flight… DO IT! Print-and-Play! The best part is, the game is VERY reasonably priced given the quality of the components (as of Xmas 2012, they are going dirt cheap online), which made it a no-brainer purchase for a huge Game of Thrones fan such as myself. Just understand that you are buying a 2 player only game that is not compatible with the LCG version. But, I’m happy to report though that there’s room enough in my gaming world for both versions! Hodor, Hodor, HODOR! I am a huge fan of the actual board game, so I’ve been chomping at the bit to finally get this iOS version, and I’m happy to report that Playdek knocked it out of the park! For those of you unfamiliar with Summoner Wars, this game pits two “Summoners” in a tactical, minis-like battle (Think MtG meets Chess/Stratego). The goal: Kill the other Summoner! Sounds simple? Well, it is, and that’s the greatest compliment I can pay this game. Summoner Wars has this organic flow which is easy to teach, simple to play and almost every game unveils giant swings of fortune, dramatic twists and turns which typically catapults you into a nail-biting conclusion. This digital version has perfectly recreated the board-game version, but has also enhanced the feel of it all through subtle artwork animations, music and sound effects. Any card can be double-clicked to zoom (which is handy, as most every card has a bit of text on it) but it condenses down to an abbreviated version showing just the basics (Attack and Hit Points). I’m playing on an iPhone 4, and it scales down just fine. The game provides for an Offline game mode which pits you against the A.I. or an Online game against your friends (which only unlocks upon making an in-game purchase). So let’s talk about the money. The full game is Free to try, however you will only be allowed 1 of the 8 current available factions to play as (the Phoenix Elves). Each of the other 7 factions and their separate reinforcement packs are available for an in-game purchase for .99 cents each, but the best bang for your buck is the “Everything Bundle 1” available for $7.99. This gives you access to the Cave Goblins, Cloaks, Fallen Kingdom, Guild Dwarves, Jungle Elves, Tundra Orcs, Vanguards, Mercenary Pack 1 AND all their reinforcement packs, which I feel is definitely worth it considering the crazy amount of variety you unlock. The game also allows you the ability to create, name and save your own custom decks (within the guidelines of deck building that the game rules allow). Do I have any knit-picks? Well, as of right now, the offline A.I. only has 4 factions you can choose to play against. There’s also no way to select the difficultly level of the A.I. and I feel it’s preset on “easy”. The A.I. can also take quite a while to figure out what it’s going to do on it’s move. These are all small things that I’m sure further version updates will likely address. If you’ve never played Summoner Wars before and would like try it free. If you’re a current Summoner Wars fan and need a mobile fix. Mattel’s redux of “Spite and Malice”, Skip-Bo is an easy going, simple family style card game for 2-6 players. Players are in a race to play out their 30 card “stock pile” via the use of 4 common build piles in a shared area. These build piles are completed by playing cards numbered 1 through 12 in sequence. (1 starts a pile, then play all the way up to 12, where the pile is then removed). Players maintain a hand of 5 cards while also having to manage their own 4 discard piles. Also included are cards labeled “Skip-bo”, which serves as the game’s wild cards and can be played as any number. This game comes with a whopping 162 card deck, but the cards play fast, so you’ll find your draw pile empty in no time… which means play is often interrupted by having to stop and have a huge shuffle break! My wife and I go through the entire draw pile at least 2-4 times per game. And since the heart of this game depends on getting sequential runs, you’ll want to ensure the draw pile gets extra-extra-shuffled so no one can just draw an easy run. My Grandma used to play this game religiously and would always have an automatic card shuffler nearby. Now I know why!! Unfortunately, the card stock they use for this game is a little more on the flimsy side, which is a bummer considering the shuffling abuse these cards will endure. All in all, Skip-bo is like Uno’s dorky cousin. And although some excitement can be had when you get on a fast playing roll (or a “Hot Run!” as my wife calls it), serious gamers won’t have the patience to persevere. A solid strategy, no matter which side you are playing, is getting the balance of the force on your side and keeping it that way. This is especially critical for the Light Side player. Taking out 3 objectives in 12 turns is easily accomplished, especially when you are receiving the additional perk of 1 objective damage every turn. But trying to get 3 objectives in 6 turns without any bonus damage is extremely difficult. If you find you are losing often as a Light Side player, reconfigure your primary goal to keeping and holding the Force, then pick up the slack later in the game when you have additional units to commit to battles. If you are a Dark Side player then all of the above reasons are exactly why you need the balance of the force on your side. It denies the Light Side of the thing they really need the most… which is TIME! The iOS application was my first exposure to Ascension. During my offline games against a single A.I., I found very helpful at first to crank up Honor Pool points from 60 up to the max 120. A 60 point game can whiz by to completion in no time. By expanding the total Honor pool points you subsequently extend the games’ length. This will allow much more time to collect a wider variety of heroes and constructs (while simultaneously exposing you to their cool combinations). Once you start to get the hang of how certain cards chain together, you can then scale back your Honor Point pool back down to the intended 60 total, forcing you to focus solely on your new found combos. This should be a great learning exercise for beginners yet still prove useful to veterans looking to seek out new combos. Look, I love this game… but if you’ve ever played this game with only 2 players, then you’ll know that the “End Game” sequence (when a player becomes the new boss by acquiring the summoning stone) is pretty anti-climactic. 9 times out of 10, one player just kills the other and it’s over… which sort of takes the “Run” out of “Dungeon Run”. To remedy this, the wife and I just play this game as fully co-op. The rules pretty much stay the same, only once the end boss has been defeated and one of up obtains the summoner stone, BOTH of us have to escape to the exit. If either player dies at this point, they are killed (as opposed to just knocked out) and both the heroes have lost the game!! Also, all of the tiles now require a new roll when entering (to check for monsters/traps/treasures), so making it back to the start isn’t just a walk in park. In this variant, the free actions “sabotage” and “summon” don’t come into play, since you are fully co-op and have no real need to screw each other over. Obviously, this eliminates all the backstabbing out of the game. 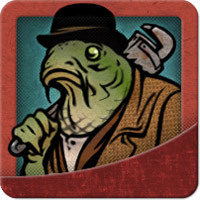 Playing cutthroat can be great in a game with a big group, but it’s almost pointless in a 2 player game. Some players might actually prefer not having to be mean to each other. So, if you are playing 2-player and want a change at the end OR just playing with someone who doesn’t particularly enjoy “being a jerk”, then give this a try!! In an effort to get more corrupted quiddity involved in the game, we play with following house rule we call “The Corrupted Deal”. Add 1 basic quiddity to your total this round. Capture an additional die from the wild this round. The interesting dilemma that occurs is whether you will voluntarily poison your own bag in an effort to get that dragon that you were just 1 quiddity short on capturing… or to capture multiple smaller creatures from the wild in an effort to build your army quicker. It adds a fun spin seeing as you get to DO SOMETHING with the corrupted dice (which 95% of the time are just sitting there untouched). One thing we’ve noticed in playing this game is that the treasure deck barely gets touched. This is shame seeing as the treasures can add a cool and powerful twist to the round (and are usually the most hilarious cards)! To remedy this, my wife and I “evoke” the house rule of everyone getting to draw 1 free treasure card each at the beginning of the round. Everything else proceeds as normal. It doesn’t noticeably unbalance the game… just makes it more chaotic!! I came across a variant where you play with the top card of the draw pile flipped over for all to see. By doing this, it opens up a new degree of strategy (seeing as everyone gets a sneak peek of things to come). It’s an interesting little tweak that presents a little more analysis. People who might be turned off by the randomness of Jaipur may find this variant just the strategic nudge it needs! I think it’s fun both ways and suggest you give it shot! This game has a tendency to stretch on for quite a while. When the wife and I don’t have the time to play a full proper game (First one to 15 power wins), we’ll lower the win requirement to just 10 power. This makes for a much more quick and dirty game since it forces you to play much more aggressively. The one drawback is that this often takes away the chance for a “late in the game turnaround” comeback. (Those who play this game a lot know it can be pretty easy to get to 10, trickier to get to 15). BUT, the trade off is we can crank through a round in 30 minutes instead of 2 hours! Mage Wars showed up at the house this week and I am super excited to finally give this big boy a test drive! Although 7 is a pretty hefty for a champion price, Silts’s “Cunning” ability really shines when used in conjunction with the other 2 champions in the deck (Biter and Kreep). Biter and Kreep are both cheap champions at 4 price, but they have liabilities associated with them when they are adjacent to another enemy. This is where Silts’s swap move comes to save the day… Example: Attack with Kreep, then swap him out with Siltz so you don’t have to pay for the “Cowardly”. The fact that you can activate Silts’s ability “At any time on your turn” literally means just that… “at any time”, including interrupting one of your unit’s 2 step movements. (Move a card 1 space, activate Silts, move the second space). This could get Biter out of some movement jams. There’s probably tons of other utilities I’m not even thinking of. (Getting next to an enemy Summoner and swapping him more directly into harm’s way, or positioning a character like “The Eater” away from commons, forcing him to be discarded). Just bear in mind you can only pull the Cunning Swap off during your turn. Ultimately, Silts’s flexibility in using his “Cunning” accounts for his hefty price tag. Hope this helps! Give some of these combos a try before dismissing him completely… he might just save your bacon one day! Grew up playing classic board games that my mom would pick up randomly at garage sales. For years played video games, but now that I'm in my 30's, the call for something more "tactile" has awoken again. Now, I'm on a quest to get my wife to appreciate all these things as much as I do! After a short stint with Magic the Gathering, we've moved on Lord of the Rings and Game of Thrones LCG. After finding this site, I think we've just stumbled into a much larger world!